Early in our full time RV'ing we discovered Hilton Head RV Resort; a gem of a resort within a few miles of Hilton Head Island. In fact, our signature Providence picture on our home page was in Site #1 at the resort. Nicely landscaped, well maintained, friendly staff and great location. Savannah, GA is a relatively short drive and is one of our favorite southern cities. We also have long time friends, Don and Carolyn Lanning, who live in one of the many golfing communities in the area. Rated in the top 300 by Trailer Life! 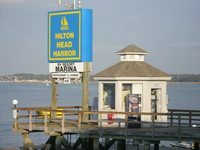 "Hilton Head Harbor due to its prime location on Hilton Head Island in lovely South Carolina, offers a semi-tropical atmosphere. 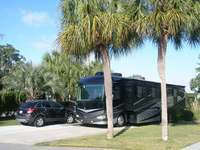 Situated on the IntraCoastal Waterway, sites are large enough for most campers or big rigs, have concrete pads, 30Amp and 50 Amp service and Cable TV at all sites. Amenities include 2 sparkling swimming pools, 3 tennis courts, playground for children, a lovely restaurant and water sports and a fishing pier available onsite. We are pet friendly. The Resort is a condominium. Lot owners receive title in fee simple subject to the Declaration of Condominium and the Rules and Regulations of the owners' association. Owners jointly own the association, which owns the recreational facilities."